The sun has been shining a little more recently which has let us get out to enjoy the weather and our surroundings. It hasn't just been us taking advantage of the weather either. I know most people probably are which for many will mean that the car is getting a bit more use to venture on days out. I'm willing to bet that along with those trips come some mess, especially if you have children. We have teamed up today with Armor All to help you combat any dirt in your car. 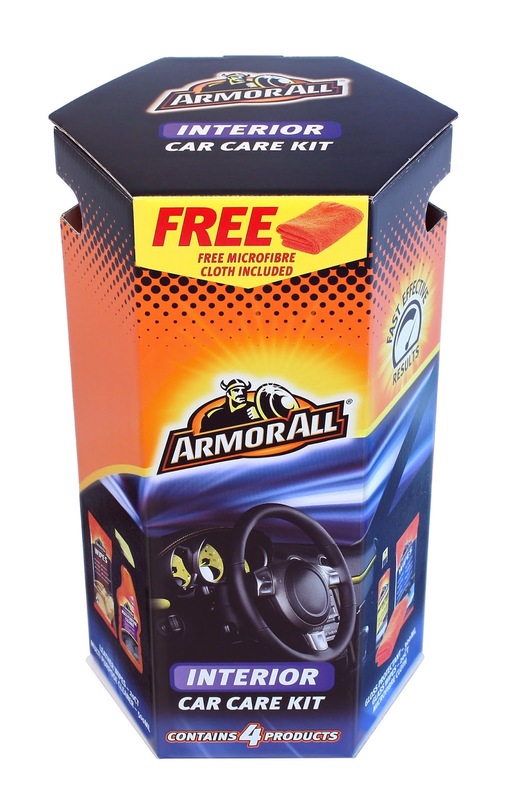 Armor All is a complete range of products made for the care of both the inside and outside of your car. With over 50 years of experience Armor All is the industry leader in car care. Their very own 'miracle formula' protects against rubber, plastic and vinyl from the effects of UV radiation, ozone and other harmful effects of nature. This formula was discovered by Joe Palcher who is the inventor of Armor All Protectant, the first product ever made, he found this way back in 1962! By 1966 a local auto shop owner got in contact with Joe and convinced him that he should bottle up his formula and sell it. It caught popularity quickly and was being used across the US in both the industry and at home by regular car owners. It wasn't until 1972 when Alan Rypinski bought the rights to the 'miracle formula' and set about renaming it to Armor All Protectant. Armor All have since been advancing their products to the entire range available today. One of those products now available is the Armor All Interior Car Cleaning Kit, containing four products from the Armor All range it's everything you need to clean the inside of your car. Since it is all contained inside one box the kit is perfect for keeping in the car. In each Armor All Interior Car Cleaning Kits you can find two packs of wipes. One pack of Armor All Glass wipes designed to be streak free while still combating the harsh effects of the road on your windscreen. These Armor All Glass Wipes can remove road dirt, bugs and even the grime of the road. Since the interior windows can still be effected by the harsh surroundings these are perfect for keeping around! They are suitable for all windows including those with a tint since there is no ammonia inside. To make them even better it only take one wipe to clean an entire window! You will also find the Armor All Leather Wipes which are made to be extra stong letting you clean the leather upholstry in your car without worry of the wipe ripping. These leather wipes contain bees wax to protect your leather and to give a nice matt finish once clean. With the protection given by Armor All Leather Wipes your seats will be protected from spills and stains while being easy to clean with just a wipe. A great product to keep your leather looking new. I think these would be especially handy to have around if you've got children who travel with you. To help you clean all the other surfaces in your car is the Armor All Multi-Purpose cleaner. With it's ability to clean many of the surfaces inside the car it is the answer to removing the need for cleaners for a specific surface. 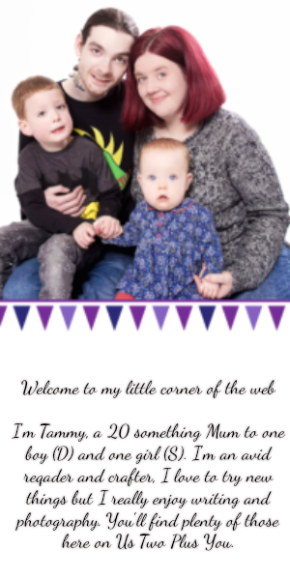 It can be used on vinyl, plastic, cloth and rubber so you really are covered on all fronts! The final Armor All product found inside the Interior Car Cleaning Kit is the Semi-Matt Protectant which was designed to combat the suns damaging effects on the dashboard of your car. The Semi-Matt Protectant cleans away the dirt and grime that builds up on the dash board and causes damage. It continues on protecting the dashboard after use too. It's formula protects the surface against the suns effects preventing fading and discolouration. A great product to have around. Inside you'll also find a free microfibre cloth to help you get all those jobs done. There really is everything you need inside. This kit is perfect for everyone who drives. 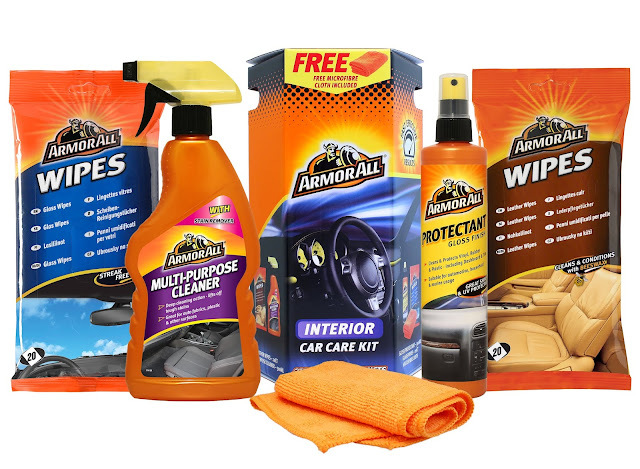 With such a great range of products inside to help you clean up your car at a moments notice! Everyone from families with children to taxi drivers and even those who only drive themselves. You can grab your own Armor All Interior Car Cleaning Kit with an RRP £14.99 the kit is also available at The Range. Armor All have very kindly given us one kit to giveaway to one of our lucky readers! To be in with a chance to win your own Armor All Interior Car Cleaning Kit just enter the Gleam widget below. Please take a moment to read over our Terms and Conditions just below before entering. Entrants must be aged 18 years or over. The winners will be selected at random from all the correct entries received before the closing date and time. All prizes must be accepted as offered. There can be no alternative awards, cash or otherwise. The PR is responsible for prize fulfillment. the leather wipes would be very handy! Armor All Glass wipes - I bet these would be handy for allsorts! The Armor all glass wipes would be fantastic to try. Multi Purpose Cleaner sounds really handy. The Glass wipes as we always have finger, paws and nose prints on the inside of our car windows! The armor all glass wipes look great! All glass wipes - i once tried to use kitchen spray - worst idea ever!! The microfibre cloths! Always get things so clean! Protectant, as dashboard seems to get dusty so quickly. The Multi Purpose Cleaner would be something we would use a lot! The Armor all glass wipes as I don't know how my windscreen get so dirty! The Multi Purpose Cleaner seems very useful! The wipes sound like a great time- saver! Armor All Glass wipes sound good to me. I am fussy about windows so clean those before anything else. The multipurpose cleaner sounds awesome! I love Armorall and use it regularly. I love the Protectant Spray. It is a Godsend for cleaning all the interior of the car and the sills and anywhere that needs a bit extra protection. Interior car clean kit would be good. I can never seem to get the inside clean. With a 5 year old in the back of my car ALL the products would be fab!! I like the sound of the Armor All Interior Car Cleaning Kits, because they sound like they would come in very handy. the all glass wipes - my windows are always smeary on the inside! Armor All Multi-Purpose cleaner sounds useful.